Oliver was born as part of Carolina Tiger Rescue’s former breeding program. Carolina Tiger Rescue, formerly Carnivore Preservation Trust, was originally founded to breed keystone species in hopes of one day releasing them into a safe environment but that day never came. The animals who were born here will remain here for life. Oliver was a quiet ocelot who enjoyed sleeping his days away and coming out to explore at night. Loud noises and big trucks made Oliver nervous so he lived away from the tour path. Keepers and volunteers had to earn his trust before he would come out to greet them; even then, he came out only when he felt like it. Oliver enjoyed tearing up enrichment boxes and spraying them with his scent to remind everyone that it belonged to him. 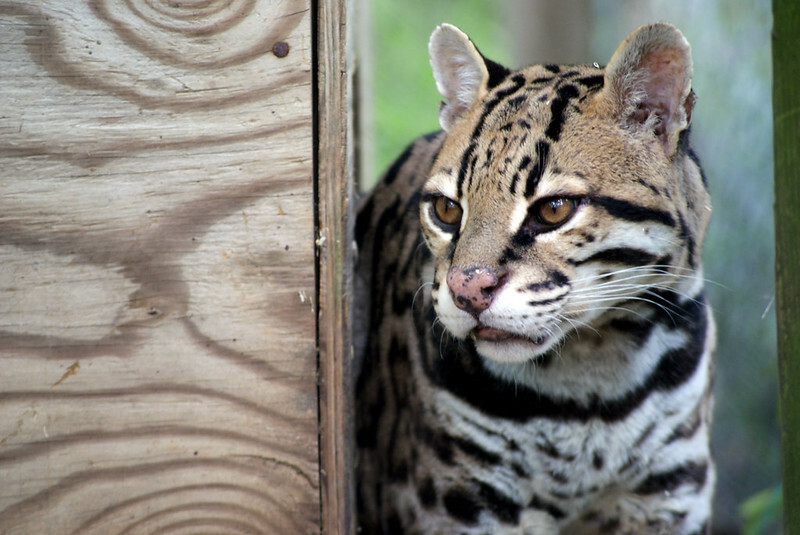 For more than two decades Oliver Ocelot has called Carolina Tiger Rescue home. He has met hundreds of people and watched so many changes in our landscape. He has lived in multiple enclosures and had many different neighbors. Unfortunately this week the staff had to make the decision to let Oliver go after a decline in his health. We have known for a while that the 22 (and a half!) year-old was in kidney failure. We knew that he was getting older and more frail as the days passed by, and we knew we needed to make the best decision for him. Oliver was a model old man. He would spend his days curled up in his warm den box or lounging in a nice sunny spot of his enclosure. He knew that he would get a treat any time a keeper was nearby. It’s not hard to fall in love with a little old man who would give you an ocelot grumble if you gave him what he wanted. And when you have reached 22 (and a half!) years-old, it’d pretty much assured that you will get anything you want! Many of you may never have met Oliver. It’s easy to miss some of the smaller, quieter animals that live off the tour path, but if you have the time, you get to meet some really amazing animals. There are many people that took extra time our of their day to go and visit with Oliver. I know that we will miss the quiet moments, sitting with the grumbly old man, just taking in the sights and sounds of the sanctuary.